Vitameatavegamin Girl | Are you tired? Run down? Listless? Food can help! This is a “go to” recipe I have been making for years but it just so happens to be Whole30 compliant. I make it every week and it is so delicious. Brown the ground beef and drain. Add all of the ingredients, stir, and simmer for 20 minutes. We eat this on top of salads, or smoky, roasted sweet potatoes, or on top of half of an avocado. On salads and on top of avocados we like to add toppings like red bell pepper, shredded carrots, garlic lime mayo, crushed plantain chips, or salsa. My husband even likes to put it on top of scrambled eggs for breakfast. It is definitely one of our favorites and I always have some on hand. 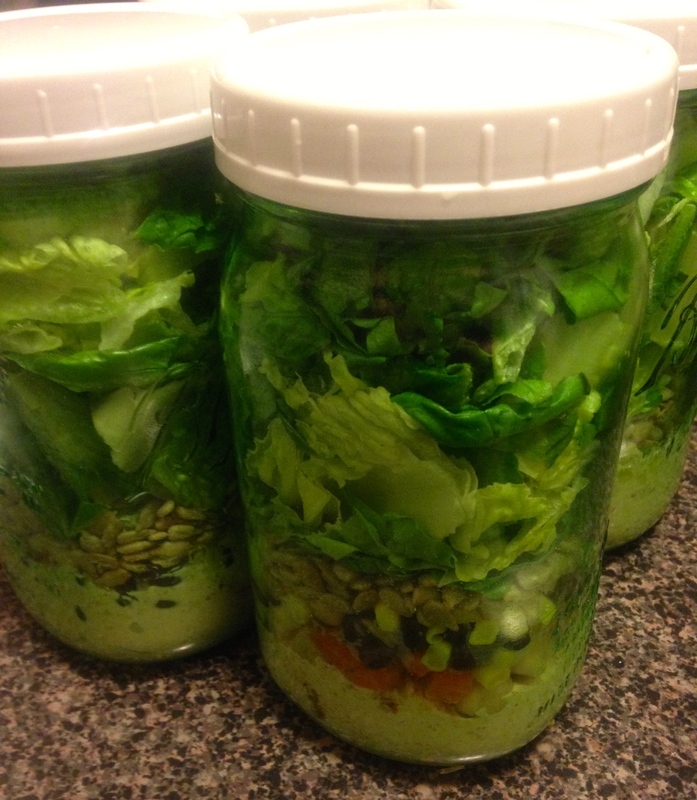 These might be an old thing, or they might be a new thing, but Mason Jar Salads are like the greatest thing ever! Is that too much excitement? Did I just sound like a valley girl? Well, these salads will do that to you. They will make you talk like an overdramatic valley girl. The best part is they are completely customizable, easy to assemble, inexpensive, and they last for up to 5 days in the refrigerator. You can use whatever you have on hand or you can go crazy with ingredients! The possibilities are endless. The key is piling the ingredients in the correct order. You want your dressing on the bottom, then your protein, then your veggies and any nuts/seeds, and then finally your lettuce until it is packed full. Screw the lid on tight, and there ya go! You just want to make sure the dressing does not come in contact with the lettuce. So far, my favorites are an Asian version and a Southwest version I’ve been doing. For the Asian version, I use a modified, Whole30 compliant version of the dressing recipe from my Crunchy Asian Slaw recipe. I substitute coconut aminos for the soy sauce and dates for the honey. I then grill some chicken with just a little salt and pepper for seasoning. I add about 3 tablespoons of the prepared dressing into a wide-mouth, quart sized mason jar. I then add the chicken, shredded carrots, red bell pepper, green onions, slivered almonds (which I toast first…dry pan, medium/low heat, 5 minutes), and then whatever else I might have on hand. I then pack in big handfuls of romaine lettuce until it is full and put the lid on the jar. I have been using the plastic Ball jar lids and I love them. Here is the link to them on Amazon. The Southwest version I have been doing is super quick because I use already cooked and prepared Chili Lime Chicken from Trader Joe’s. It is so delicious and really comes in handy when you are crunched for time. I also use their pre-washed, bagged lettuce and their shredded carrots. I either mix up a southwest vinaigrette or I’ll add lime juice, chili powder, cumin, and garlic powder to store bought ranch. Both options taste great. I then add the chicken, red bell pepper, shredded carrots, sunflower seeds, and then the lettuce. I have also thrown in some broccoli if I have it on hand. When you are ready to eat, just dump the contents into a bowl or eat straight out of the jar. I like my salad really mixed together so I usually eat it from a bowl. With just a little preparation one night, you can have your next 5 lunches all ready to go! It is really unbelievable and I love them. A lot. It has always been hard (nearly impossible) for me to get my recommended intake of veggies. I mean, honestly, it was hard for me to eat any veggies (except lettuce) at all. Mainly, because I did not like them unless they are blended to smithereens in a Vitamix. So a few years ago my husband and I decided we were going to work on our veggie consumption. The only thing we regularly ate before was broccoli. Well, that was good and all but come on, two adults…in their 30’s…squeamish around veggies??? It wasn’t cute anymore, and frankly, has always been a bit ridiculous. But nonetheless, there we were. I started sautéing, roasting, and steaming, and before long, we had a pretty impressive list of veggies that we consumed and actually enjoyed. But those were cooked veggies. Who even thought about raw ones? Well, this year we decided (I think mainly “I” decided…your secret is out Mr. Hodge!) that we were going to try to eat more raw veggies. Actually, just the thought of it made me cringe. Until now. 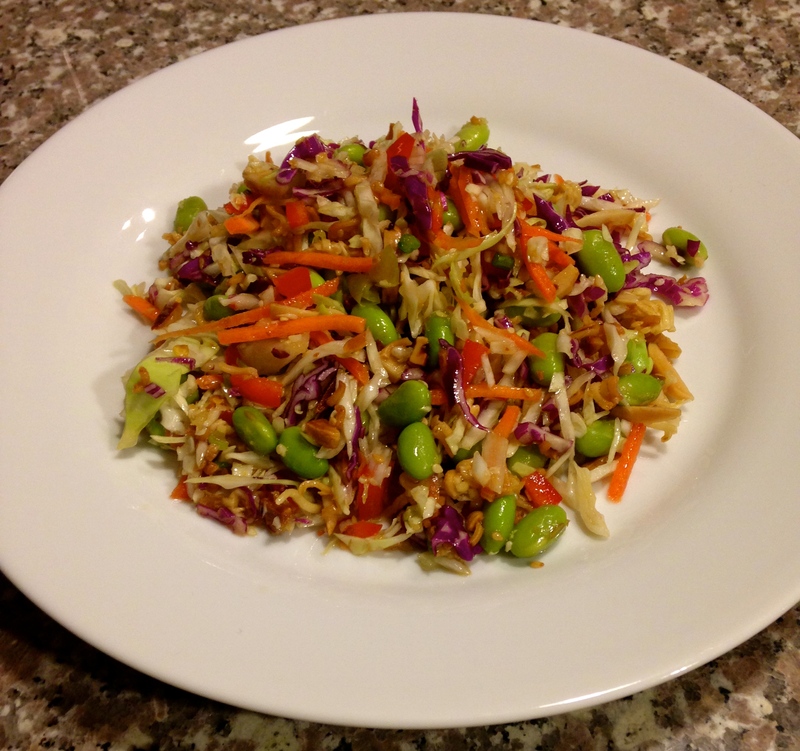 CRUNCHY ASIAN SLAW! Three words, say them with me…CRUNCHY ASIAN SLAW! I found the original recipe here on the Tasty Kitchen Blog. I made a few modifications and WOW! I had a friend over for lunch and made this but I was nervous to try it. Once I did, I almost couldn’t stop eating it. The real surprise was when my husband got home from work I suddenly heard crunching going on in the kitchen. I turned around to find him inhaling it! It was a proud day for the both of us. Start by making the dressing. Combine all of the ingredients EXCEPT for the Olive Oil. Once all of the dressing ingredients are combined, slowly drizzle in the olive oil while whisking vigorously. Set the dressing aside. In a skillet on medium heat, melt butter (or coconut oil) and place almonds, sesame seeds, and crushed raman noodles into the skillet. Begin to brown these ingredients on medium heat and stir every couple of minutes. It should take about 10-12 minutes for them to become nice and toasty. ***If you can’t handle the thought of eating raman noodles, just substitute more almonds and sesame seeds). Once browned, set these ingredients aside to cool. Go ahead and cook the soy beans and set them aside to cool as well. Then combine the cabbage, carrots, peppers, and green onions in a large bowl. Add the cooled soy beans and crunchy almond mixture to the bowl. Drizzle dressing on the ingredients and toss well to combine. And there you have it! Crunchy Asian Slaw. Trust me, it is delicious and you won’t be able to get enough! Add them to your blender in the order listed and blend! This recipe makes about 24 ounces so it is perfect for 2 people or to make one and save one for later. I had my husband try it just in case my taste buds were delusional from too much veggie juice, but he agreed that it was super good. So trust me, this recipe is a keeper. 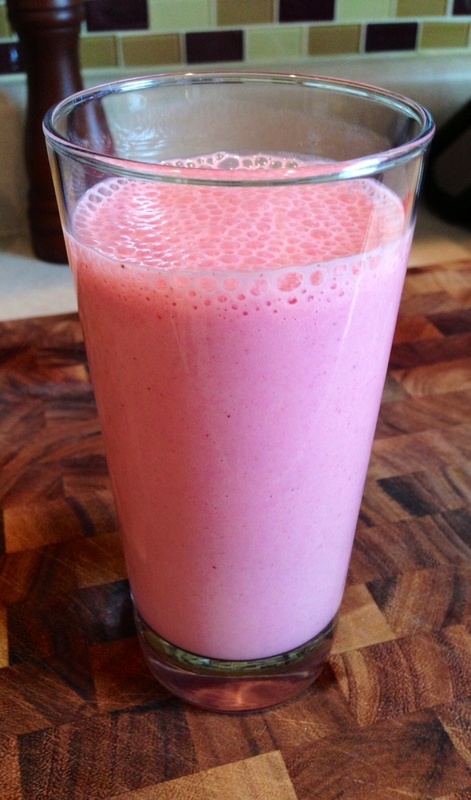 Add all ingredients to a blender in the order listed and blend. Recipe makes 4 servings. 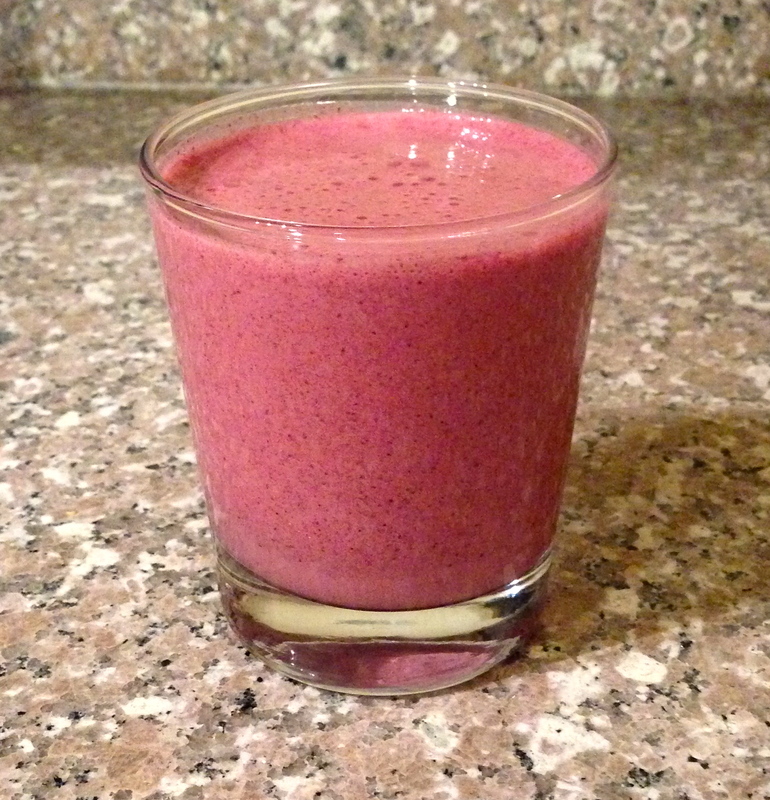 Make this smoothie today, or tomorrow. Trust me, it will become an instant favorite! Okay, so I know that this is becoming a popular trick but I just had to try it for myself. And let me tell you…it works! 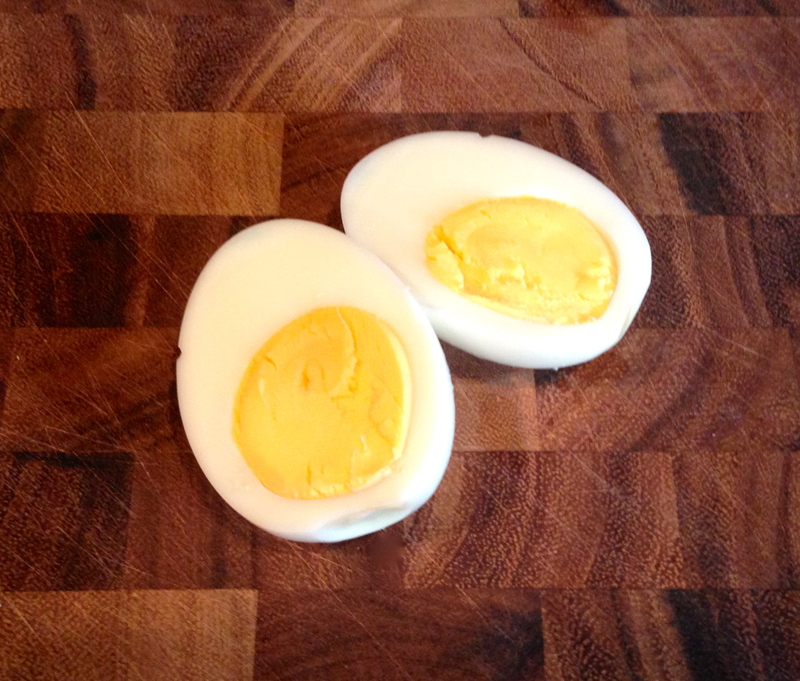 We like to keep hard boiled eggs in the fridge during the week to use as snacks or as an addition to salads, but I hate the process of boiling them. I came across this trick and just had to try it out. 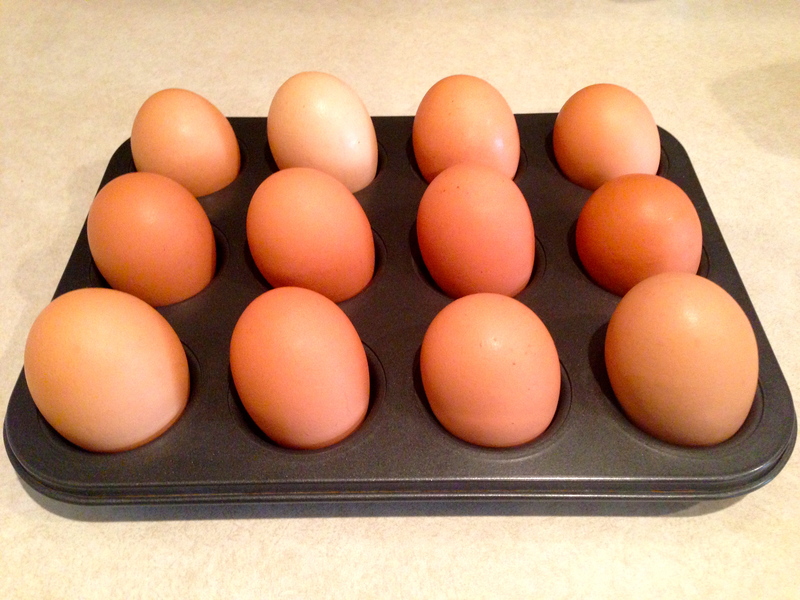 After removing eggs from the oven, add them to an ice bath to stop the cooking process. And boom! That’s it! I also noticed that the shell comes off a LOT easier and the yolks are perfectly yellow and not overcooked. Could it get any better? Not as far as hard boiled eggs are concerned. On a side note, when you are shopping for your eggs, you will most likely see labels like “Vegetarian Fed,” “Cage Free,” “Grain Fed,” “Free Range,” “Hormone-Free,” etc. Let me just say that most of these labels do not mean anything and are marketing schemes used to get you to pay more for your eggs. Cage free and free range chickens are still housed in large buildings that are “technically” still a cage. The labels “Vegetarian Fed” or “Grain Fed” refer to the fact that no fillers or animal byproducts were used to feed the chicken. As far as hormones are concerned, the USDA states that it is against Federal regulations to give hormones to chickens or pigs. It only applies to beef. Does this mean that is always followed? Or course not. But a label that reads “hormone free” is most likely another marketing scheme. It is important to look for “antibiotic free,” which means the chicken was not raised on any type of antibiotic. Also, if you really care about how the chickens are treated or the quality of the chicken, get “Certified Organic.” Otherwise, just pick up the cheaper dozen and scramble, boil, or poach until your heart is content! Sometimes you just gotta have something sweet. Of course, chocolate dipped strawberries are a classic and don’t require much of a recipe but I always find myself forgetting about making them. But geez, once I do, I wonder why they weren’t at the forefront of my mind. 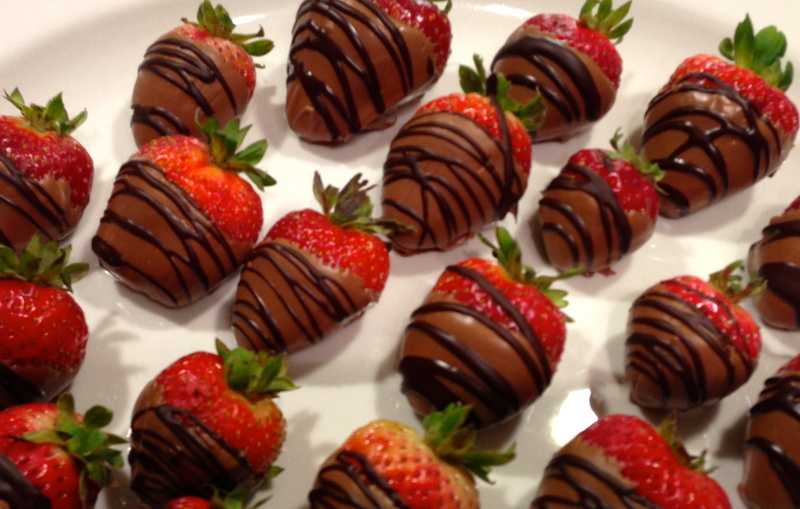 So here is your reminder…go make some chocolate dipped strawberries! Give the chocolate bar a rough chop then add it to a double boiler. For me, a double boiler consists of a glass cooking bowl placed on top of a pot that is filled with about 2 inches of water and brought to a low boil. Then I add about 1 tbsp. of heavy cream and 1/4 tsp. of instant coffee (it has to be INSTANT coffee). The instant coffee intensifies the chocolate flavor and…wow! Mix chocolate until smooth. 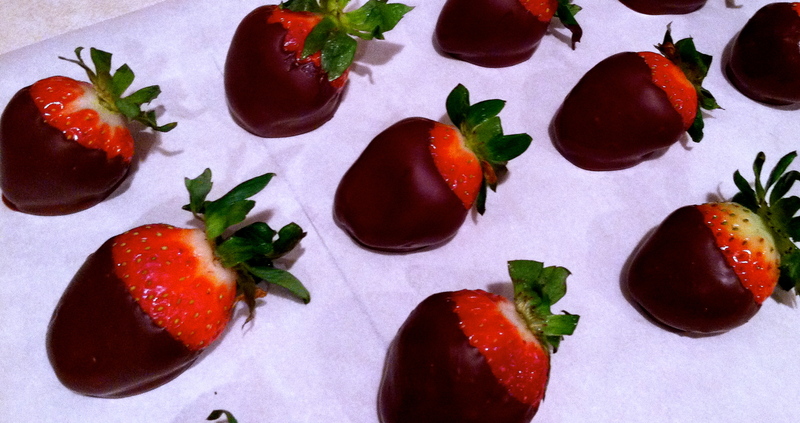 Dip the strawberries in the mixture and place on wax paper until dry. If you’re feeling a little crazy and have some leftover chocolate, go ahead and try dipping some pineapple pieces or even some apple slices. Or if you have a different kind of chocolate, you can melt a little bit of that and use a spoon to drizzle a layer on top of the fruit like I did in the picture below.